Everybody loves sale. May be yes, may be no ;) but I love sale... App sale, yeah.. Especially , when it was an app which on your wishlist who's going on sale or may be goes free.. However, when our lovely wishlist apps will go free or on sale? Right now, I will post the most 3 apps which I think really useful and helpful to track sale on App Store . Can't be patient...? Just buy it when your wishlist app goes to sale. AppZapp gives price alert feature to set on which currency you want to be alert. As example: an app is cost $3.99, use the price alert button, then set to currency that you want, as example you want to get notification while the app drops price till $0.99. So, when the app drops till $0.99, a push notification will pop up for letting you know about it. Also, you might get an email notification about it. Sort the sale apps which you want by using this feature . 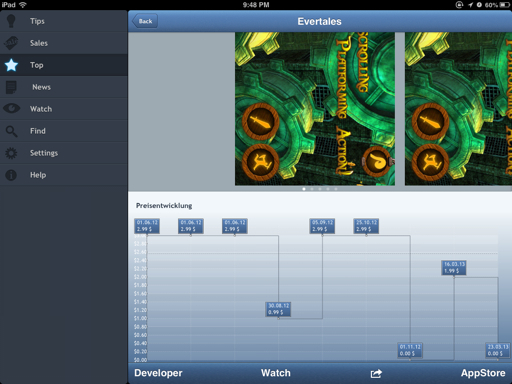 For example: I only want iPad app, using English language, and show all apps (not only popular), and selected categories. You can choose which suitable for your main necessity. 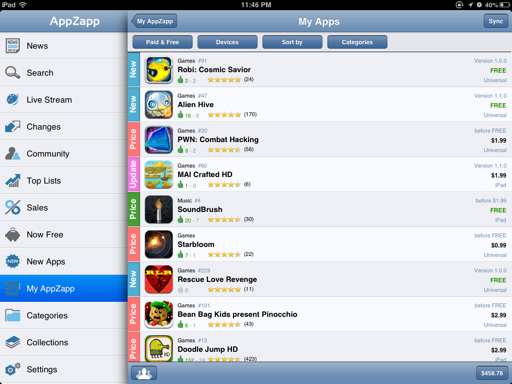 Beside AppZapp, I also use AppShopper, it's mostly has the same features as AppZapp, but it doesn't have community feature. Anyway, for using the features properly, you need to register using your email address or Facebook account. 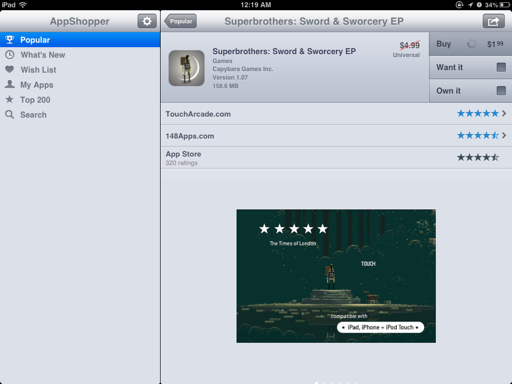 Sometimes AppShopper has more bargain apps than AppZapp. 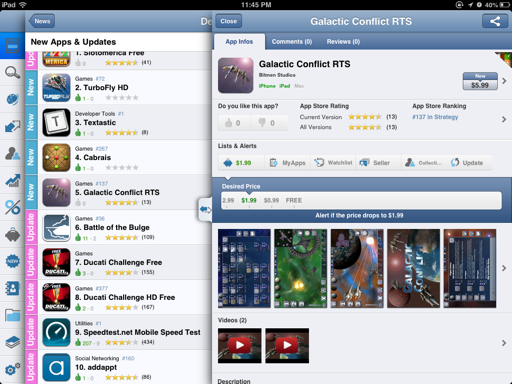 Also it related directly to iOS review sites like TouchArcade or 148apps. You can see the review site's score directly. 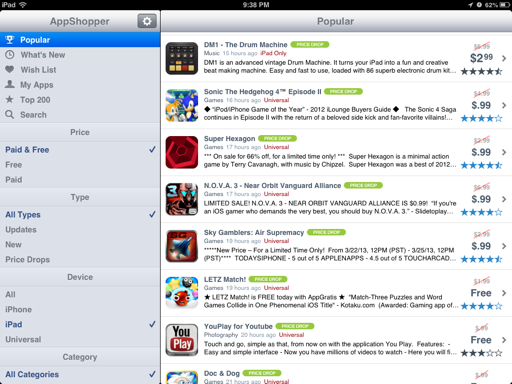 Though AppZapp also has this feature too, but for me, AppShopper did the UI for rating star better than AppZapp did. 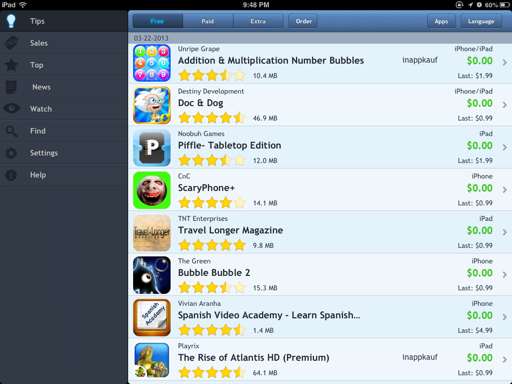 Overall, the most recommended is AppZapp, but I also use others as companion apps.